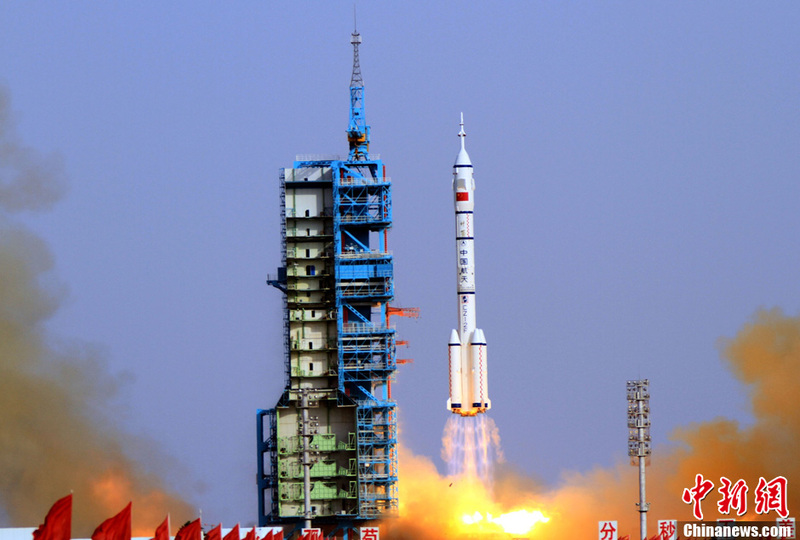 The Chinese Long March 2F Launch Vehicle is a part of the Long March Rocket Family and is primarily used for human Space Flight in particular for the Shenzhou Program. The launcher is based on the Long March 2E Vehicle and features a launch escape system and other improvements for manned missions. CZ-2F is also called Shenjian meaning divine arrow. Long March 2F is a liquid fueled two-stage rocket that is equipped with four liquid-fueled strap-on boosters that are ignited at liftoff and provide extra thrust during the initial ascent phase. 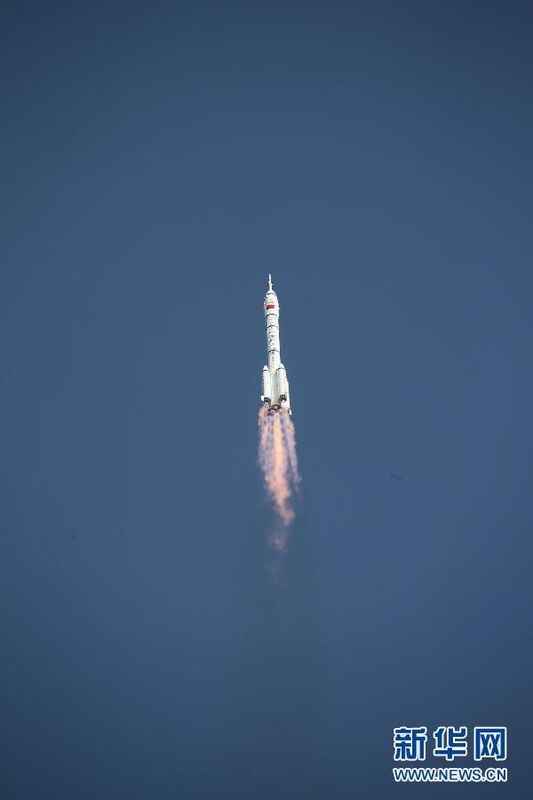 It is operated from the Jiquan Satellite Launch Center located in the Gobi desert approximately 1,600 Kilometers from Beijing. CZ-2F made its maiden flight on November 19, 1999. So far, it has made 11 Flights with a success rate of 100%. 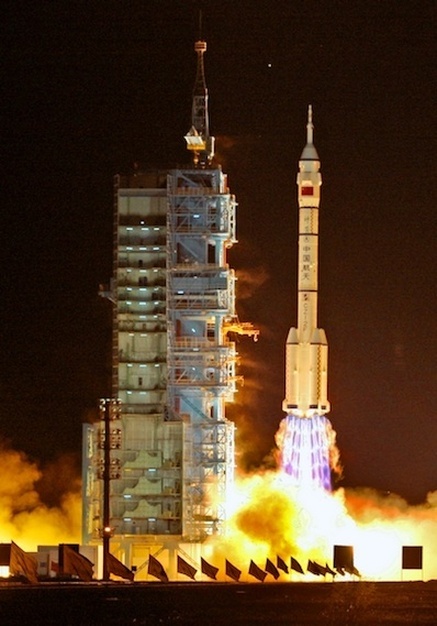 It has launched all previous Shenzhou Missions and delivered the Tiangong 1 Space Station Module to Earth Orbit in 2011. The vehicle is capable of delivering payloads of 8,600 Kilograms to Low Earth Orbit and 3,500 Kilograms to Geostationary Transfer Orbit. Its unmanned version can lift heavier payloads to orbit. 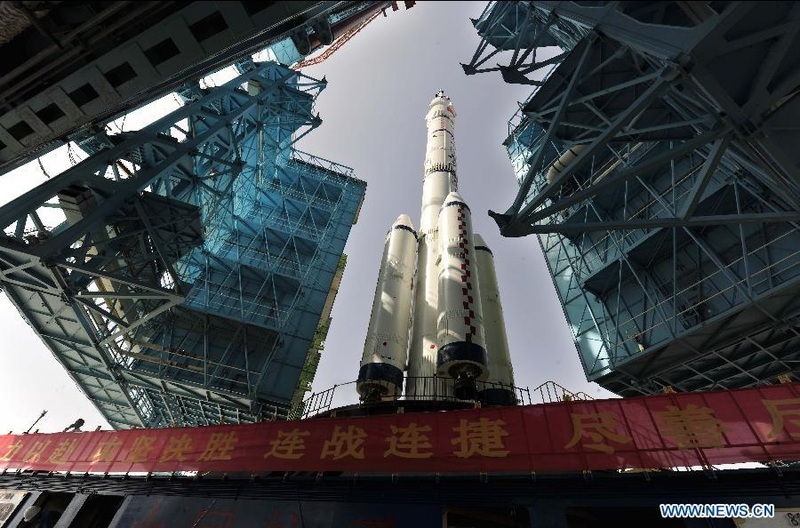 The Long March 2F Launch Vehicle stands 58.34 meters tall and has a main diameter of 3.35 meters. It has a liftoff mass of 479,800 Kilograms. 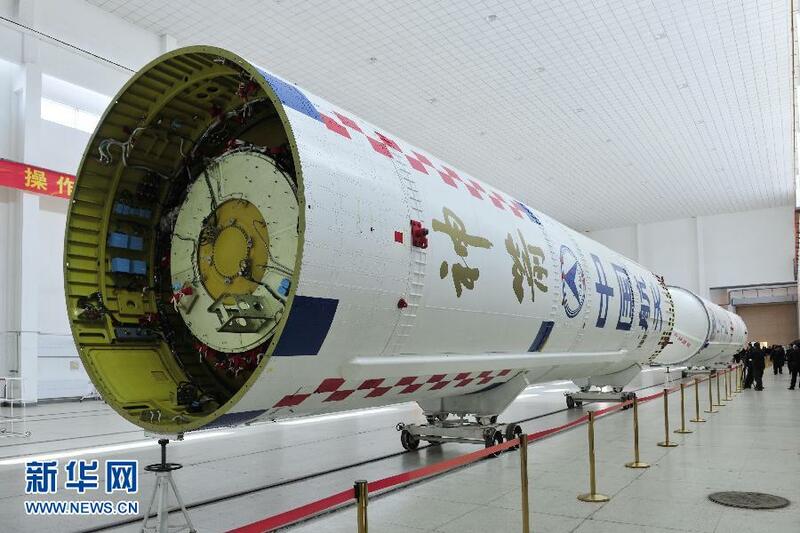 The first stage of the Long March 2F vehicle is 28.5 meters in length and 3.35 meters in diameter. It has an inert mass of 12,500 Kilograms and holds 186,500 Kilograms of storable propellants at liftoff that are consumed by the stage’s four YF-20B Main Engines. YF-20B provides 814 Kilonewtons of Thrust and has a Area Ratio of 10. The engines use Unsymmetrical Dimethylhydrazine as fuel and Nitrogen Tetroxide as oxidizer as they operate at a chamber pressure of approximately 71bar. The Engines can be gimbaled for attitude control. Guidance is provided by the second stage. First stage burn time is 166 seconds. During the initial 126 seconds of powered ascent, the ground-lit strap-on boosters provide extra thrust to the vehicle. Four liquid-fueled boosters are clustered around the first stage and each features one YF-20B engine. Each of the boosters is 15.3 meters long and 2.3 meters in diameter holding 37,800 Kilograms of propellants, having an empty mass of 3,000 Kilograms. Total vacuum thrust of the first stage with its boosters is 6,512 Kilonewtons. At T+126 seconds the boosters are jettisoned and fall back to Earth. Each booster has four attachment points to the core stage. Pyro-Mechanisms are initiated to separate all boosters simultaneously and small separation rockets generate outward separation force. When the first stage has burned out it separated from the second stage via hot separation meaning that the second stage ignites before actual stage separation. 14 explosive bolts unlock the first stage and the combustion exhaust of Stage 2 pushed the core stage away from the launcher. The Upper Stage of the Long March 2F Launcher is 15.5 meters long and 3.35 meters in diameter having an empty weight of 5,500 Kilograms. 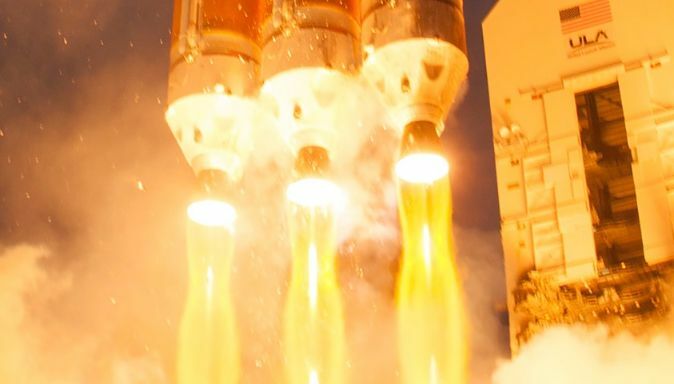 In total, the second stage holds 91,500 Kilograms of Nitrogen Tetroxide/Unsymmetrical Dimethylhydrazine Propellants that are consumed during its 300-second burn by the single YF-22B Main Engine and the four-chamber YF-23 vernier that fires nearly two minutes longer. YF-22B provides 738 Kilonewtons of vacuum thrust operating at a chamber pressure of 71bar. It has a diameter of 1.0 meters and is surrounded by four vernier thrusters. YF-23 provides 47kN of thrust and independently gimbals its four nozzles for three-axis control of the rocket stage. For non-propulsive flight, attitude control is accomplished with Hydrazine thrusters: four 45N pitch thrusters, a pair of 45N yaw thrusters, and four 11N roll thrusters. Unlike the Long March 2E, CZ-2F features a redundant flight control system consisting of fault-tolerant flight computers and navigation instruments such as inertial measurement units and GPS Systems. CZ-2F features Launch and Ascent Abort Capabilities during the complete ascent phase. In the early portion of the mission and while sitting on the Launch Pad, the crew can be evacuated by the use of the Launch Escape System. On top of the Rocket is a Launch Escape Tower that is used for Launch Aborts from 15 minutes prior to liftoff and during the first 160 seconds of the flight. The abort can be triggered by on-board computers and manually via radio signals as well as by crew command. 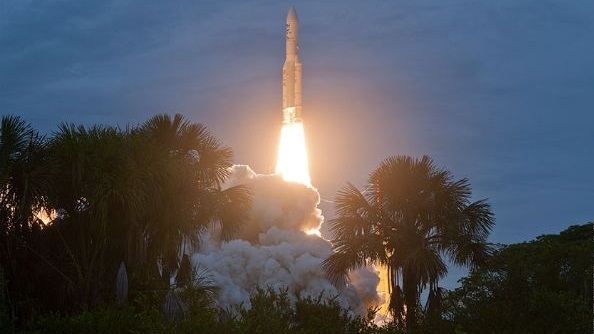 Events that cause an immediate launch abort include loss of control, premature booster stage separation, loss of pressure in the combustion chambers, lack of velocity and loss of thrust. In case of an abort, the Entry and Orbital Module of Shenzhou are pyrotechnically separated from the Service Module and the Upper Payload Fairing separates from the lower portion. Solid Rocket Engines on the 8.35-Meter Launch Escape Tower then fire to transport this upper composite consisting or Entry Module, Orbital Module, Upper Payload Fairing and Launch Escape Tower away from the vehicle. This upper structure has a mass of 11,260 Kilograms, is 15.1 meters long and 3.8 meters in diameter. The Launch Escape Tower is equipped with four axial vernier motors, a low altitude separation motor with eight nozzles, a medium altitude escape motor with four nozzles and four high-altitude escape motors. Up to a point 120 seconds into the flight, the low and medium altitude motors would be used while the high-altitude motors would be used for aborts from T+120 to T+160 seconds. At the 160-second mark, the Payload Fairing and the Launch Escape Tower are jettisoned. After that, the nominal launch abort scenario is an emergency shutdown of the first or second stage followed by spacecraft separation. Then, the modules would separate and the Entry Module would re-orient itself in preparation for ballistic re-entry. The abort trajectory that takes the Spacecraft to a landing point somewhere downrange the ground track largely depends on the timing of the failure. The later an abort occurs in the ascent, the higher the G load the crew and vehicle experiences. After Entry, the vehicle performs nominal landing operations including the parachute deployment sequence, heat shield jettison and Soft-Landing Engine ignition to bring the crew back to Earth. All abort scenarios are considered to be survivable by the crew. The Payload Fairing protects the Shenzhou Spacecraft while waiting for launch at the Launch Pad and during atmospheric flight. It also provides structural integrity for launch abort scenarios and transfers loads from the launch escape system to the capsule. It is jettisoned with the Launch Escape Tower at T+160 seconds. At that point, aerodynamic and thermal loads are acceptable for the spacecraft to be exposed after the launcher has left the dense portion of the atmosphere. 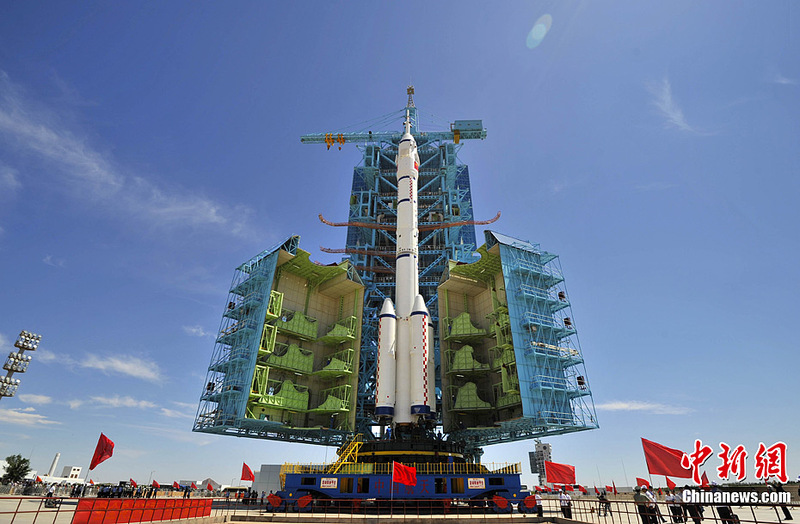 For Shenzhou Missions, a stretched version of the typical Long March fairing is used. It consists of four parts, two upper halves and two lower halves. 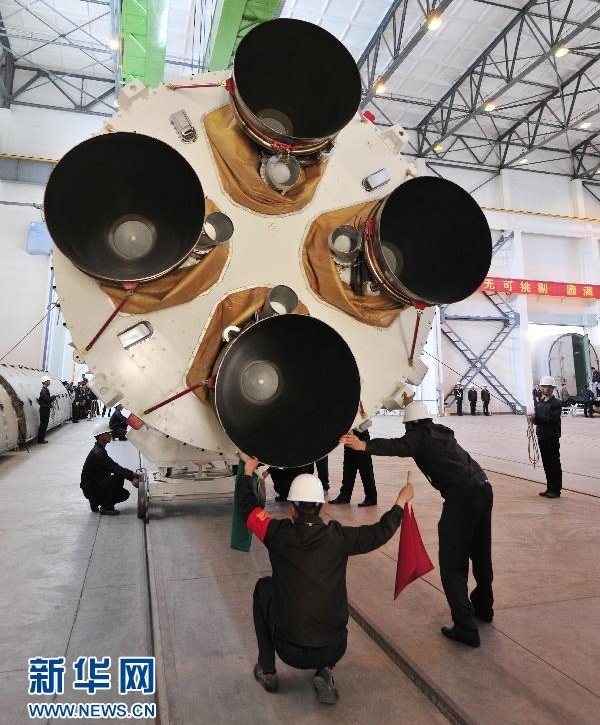 The fairing utilizes aluminum honeycomb sandwich structure. Four aerodynamic stabilizers are attached to the upper part of the fairing that is part of the Launch Escape System in a escape scenario, those would deploy to stabilize the vehicle while flying under the Launch Abort Engines. The Fairing’s ‘wings’ are in a stowed position for flight.